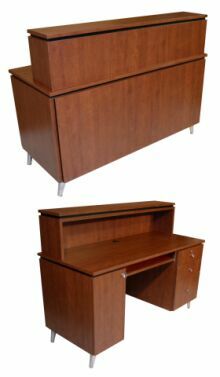 4416-56C QSEp Beta Reception Desk with overlay front panel, locking cash drawer w/ cash till, utility drawer, pull-out keyboard tray in chair-well. Left cabinet houses computer; design requires flat-screen monitor. Overall 56"W x 24"D x 42"H. Pictured with optional cast aluminum legs in lieu of standard 5 1/2" toe-kick base.